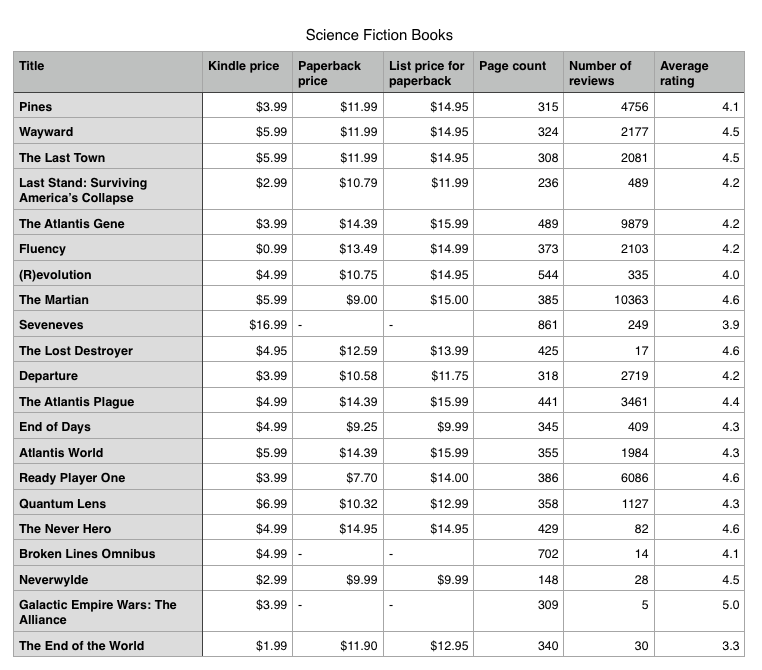 A couple of weeks ago I finished up a series on choosing the right price for your book, looking at a number of different factors that you can use when setting your price. Today, I’d like to turn all of that theory into a more real-world example with a case study. We’re going to be looking at a hypothetical science fiction novel. This novel can also be classified into the time travel sub-genre, and it’s about 350 pages long. We’ll also say that it’s been on Amazon for a little while now and has five reviews. 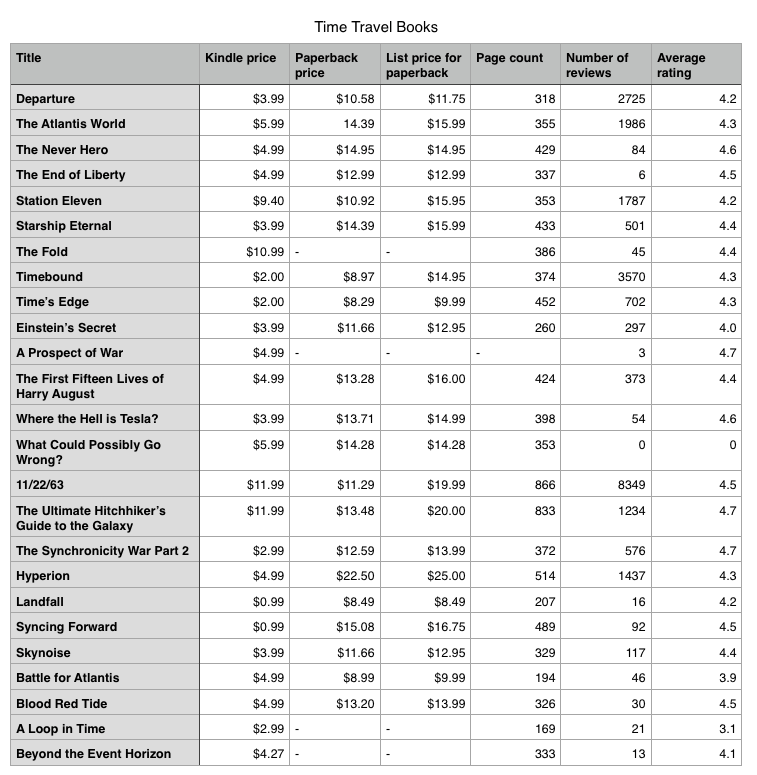 What I’m going to look at in this article is the techniques from the third part in the series on choosing your book’s price. Those are the process of gathering data about similar books and doing research on what is considered a fair price by your audience. What’s going to help us most here is finding the average price in these categories. Happily, my spreadsheet software will do those calculations automatically, so this won’t take long at all. To help us with that, I’m going to look at a poll conducted by The Fussy Librarian deal site. This poll asked over 1,200 people what they think is a fair price for a full-length novel in e-book format. Reading through the results, it looks like the majority (almost 21%) voted that a fair e-book price is $3.99. I know this whole process of gathering and reviewing all this data seems like a lot of work, but believe me when I say that it’s well worth your time. You’ll begin to understand how the pricing the in Kindle store works, giving you a frame of reference for setting your own book’s price. It’s a great tool to have, and all that keeps you from using it is a bit of effort. Hello! I found your blog through Faith Blum’s. It seems very helpful. Do you have a link to a template or something I could use for the spreadsheet? Having a template for this is a great idea! 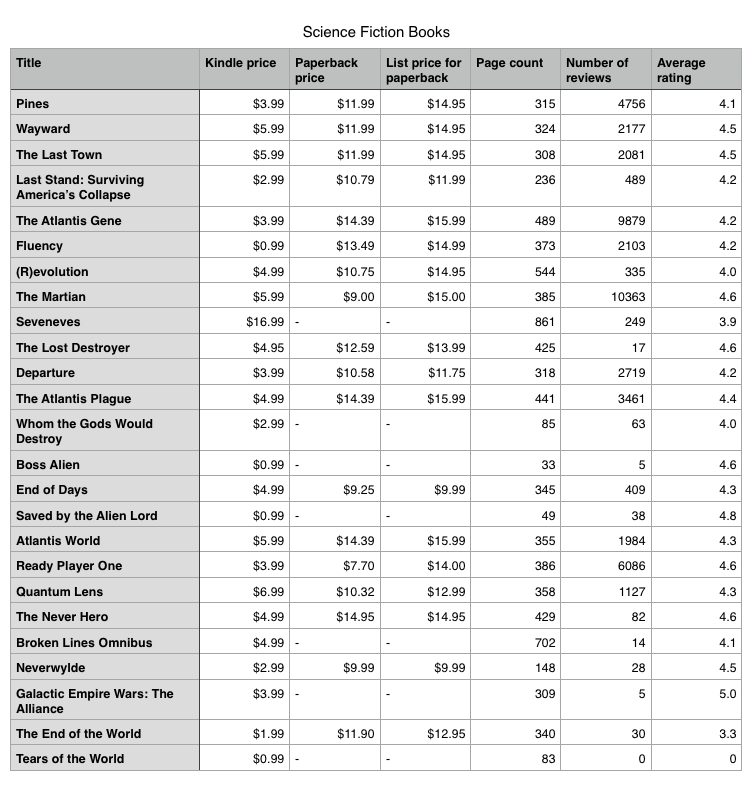 I just updated this post with a link to download a spreadsheet with blanks for all of the book details I gathered. Here’s a link straight to that file.